It is London 1663 and science flourishes in a mini-Renaissance. Celia Barber shares her father’s shop; he barbers, and she heals during a time when women are not allowed to practice medicine. 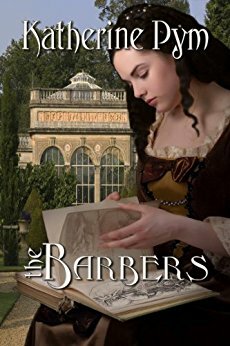 As a licensed barber, Celia longs to visit the Royal Society or Surgeon’s Hall to see a dissection, but women are not allowed. She befriends a viscount who sneaks her into the Royal Society, where she sees an experiment and meets Robert Hooke, the great scientist of the day. Celia’s sister works as a domestic in Whitehall Palace, who finds an ancient coin. Will it lead to hidden treasure? Life in London is harsh. People sicken and die easily. As a healer, Celia sees tragedy. She cannot save all who come to her. Hardest of all, will she be able to save her brothers? During the 17th century, barbers were often also used as healers. In this story, Celia's father is the barber and Celia hones her skills as a healer. The story takes place in the aftermath of the execution of King Charles I, in the grimy streets of the seedier parts of London. I found this setting fascinating, especially because the author did not hesitate to bring out the crime and desperation. The characters are wonderfully quirky and nicely developed and believable. Most remarkable was the amount of research the author conducted into the various herbs, tinctures, and practices (both good and evil) of the healing arts of the time. I liked how the heroine demonstrated the strength and courage to maneuver among the prejudices against women healers and surgeons. She dreams big - one day hoping to be accepted into the Royal Society of Surgeons. Her skill takes her from the streets of London into the Palace of Whitehall where her talents overcome her lower rank and allows her to hobnob with the nobility. It is there that she falls in love, but faces a life altering decision. This is not the first novel by Katherine Pym that I have read, and it definitely won't be the last. Why? Because she is able to take historical details and with great accuracy, weaves them into a enjoyable read! Her characters tug at the heart, her scenery so real you feel transported. Highly recommended!